white rays depending on the hybrid. Size: 16/64 -18/64 - 20/64 - 22/64 - 24/64. Volume per 40 feet container: Approximately 22 Mton. 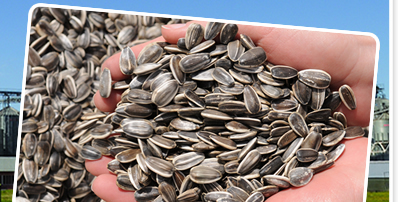 Argentina is one of the main world producers of both confectionary and oil sunflowerseed, due to its ideal combination of soils and climate, which allow to harvest important crops not only in terms of volume but in quality as well. The confectionary sunflower, in contrast with the industrial one, is used for direct human consumption. It is used as a snack or in bakery, restaurants, etc. It is traded with its shell untouched called inshell or dehulled (kernel). The confectionary sunflower grain is easily recognized for its great size and it whitish black color with its stripes alongside, which differentiates it clearly from the industrial sunflower grain which is totally black and smaller in size. Its fat content is much lower than the oil one, but not for this is not a healthy and nutritious food, rich in nutrients and vitamins, recommended for a healthy diet. The grain is classified according to the size of its diameter (the bigger the best). The existing options are the following, expressed as a fraction of one inch (25,4 mm) and its equivalent in milimetres. 1) 24/64 > 9,54 mm. 2) 22/64 > 8,73 mm. 3) 20/64 > 7,94 mm. 4) 18/64 > 7 mm. 5) 16/64 > 6,35 mm. The three bigger sizes are destined mainly to the export market for human consumption, and the two smaller sizes, are mainly consumed in the domestic market and less in the export market as inshell (its being exported mainly as kernel), but there is also as well an important demand for birdfood for these sizes, either inshell or as kernel.